The Korean Grand Prix circuit was designed by Hermann Tilke, and hurriedly put together by organisers to be ready in time for the 2010 season. With the paint still drying, it presented a new challenge for drivers - an incredible lack of grip that only brand new tarmac can provide. The stunning ocean views couldn't make up for a lack of racing and local interest, however, and the race was dropped at the end of 2013. Development of the South Korea circuit was hampered, mostly by the weather, but also by some internal wrangling. It was still in progress as the paddock began to fill up for the first race in 2010. White lines were painted just days before cars took to the track, and there were piles of bricks and rubble hastily pushed into corners to allow the action to take place unhindered. The track surface was slippery as the tarmac had only been laid ten days beforehand, but gradually the weekend unfolded without major incident. Enthusiasm for the sport is hard to establish, with circuit organisers unsure of exactly where they stand. In 2011, the grandstands on Friday and Saturday were left mostly empty, despite some fans waiting outside wanting to be allowed in to see the action. Sunday saw a healthier crowd, and thankfully the action unfolding before them was worth watching. The track was only on the F1 calendar for four races, three of which were won by Sebastian Vettel. It dropped off the calendar after the 2013 race, and there were rumours of a return in 2015. The Koeran Grand Prix appeared on the provisional calendar for that season, although it wasn't clear if it would be a race held at the KIC, or at another street circuit instead. It didn't appear on the final schedule, anyway, remaining off the calendar for the forseeable future. 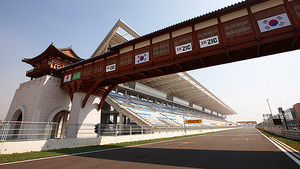 Learn more about Korean International Circuit with the Pocket F1 Handbook. The Korean International Circuit provides a dusty and down-right green surface early on in the weekend, but by now the drivers have got some rubber down and should be a little happier with the tarmac.